Visit famous landmarks and sample different cultural delights with this incredible Personalized Around the World Book! 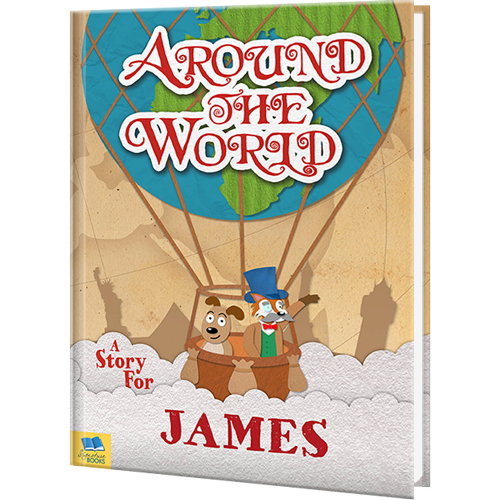 In this amazing story book, your child is taken on a round-the-world trip with the adorable Phileas Fox for company. They visit loads of interesting places, including Egypt, India, China, Japan, Australia and Europe. Your child gets to travel by all different modes of transport, such as a hot air balloon, plane, boat, magic carpet and even on the back of a dragon! With your child's name appearing throughout the delightful rhyming text, this beautifully illustrated book is the perfect fun-packed travel guide for young children. An awesome, educational gift for any occasion.